An Apple patent application (20080001787) for “Dynamically Controlled Keyboard” published today describes a chameleonic keyboard with changeable OLED key faces. The patent app was filed on March 13, 2007. Methods and apparatus, including computer program products, implementing and using techniques for providing a computer peripheral including one or more keys. Each key has several light emitting diodes disposed on a face of the key. Each of the light emitting diodes can switch on or off in response to a data signal received from an application specific integrated circuit dedicated to the key. A corresponding key and manufacturing method, as well as a computer system including one or more such keys are also described. Broadly speaking, the present invention provides methods and apparatus for dynamically altering the key faces of keyboard keys, such that they show an accurate representation of what action will occur when a particular key is depressed. In one embodiment the altering key faces are accomplished by placing a number of organic light emitting diodes (OLEDs) on each key face, and using an application specific integrated circuit (ASIC) placed inside each key to turn on and turn off the respective diodes. The respective ASICs are controlled by signals originating from the software application in which the user is currently working and by the selected language locale. As a result, the users always have current and accurate information in front of them about what will happen when a particular key is depressed on the keyboard, and there is no need to memorize what actions particular key depressions will cause. In general, in one aspect, the invention provides methods and apparatus, including computer program products, implementing and using techniques for providing a computer peripheral including one or more keys. Each key has several light emitting diodes disposed on a face of the key. Each of the light emitting diodes can switch on or off in response to a data signal received from an application specific integrated circuit dedicated to the key. Full U.S. patent app here. MacDailyNews Take: If it comes to fruition, hopefully it’ll cost a fraction of the Optimus Maximus LED keyboard which is currently going for US$462.27. ” rel=”nofollow”>Here’s a rare look at the designer. I have a hard time believing that this is an Apple product since Apple have always used a “Delete” key and not a “BackSpace” key. 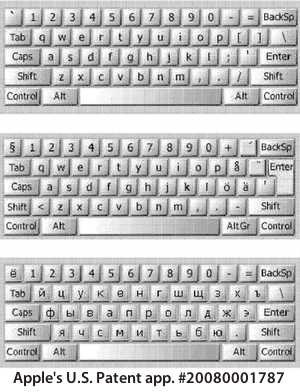 How can Apple patent this when Art Lebedev introduced the Optimus Maximus Keyboard ages ago? OLED? I just got used to QWERTY…. I saw a security keypad back in late 80s that had clear plastic keys and LED matrix display under. Every time you entered the code, key values were shuffled so onlooker could not figure out which values you pressed. There’s a Klingon version for special needs customers. Like Zune owners. WTF? More toys from Cupertino. I can hear the MAC sheep now: “Ohhhhh look at the fancy lights! It will be a couple of years before Microsoft has anything close to this.” Whatever. Is this where the R & D money goes from your expensive computers? Hey Apple, how about coming up with a phone that can integrate with an Exchange server? My mother-in-law lives in Krasnoyarsk, Russia. I would like to get her a MacBook so she and my wife can communicate (and so she can see the grandkids) via iChat. I am not thrilled with the keyboard stickers that place the Cyrillic characters on the keyboard. A chameleonic keyboard that changes the layout automatically with the language would be the beesknees.